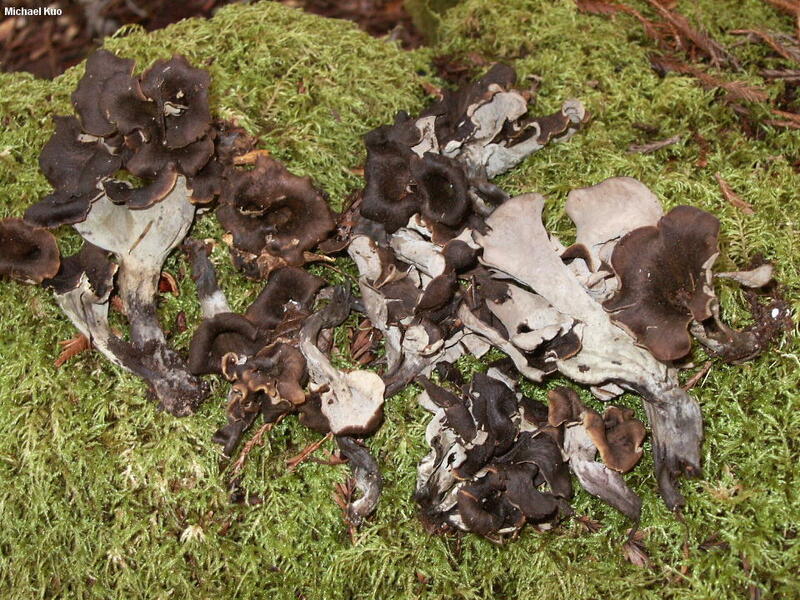 This West-Coast version of the "black trumpet" is different in several important ways from eastern North America's Craterellus fallax. It is a bit more robust than its eastern counterpart, and its spore print is whitish or creamy, rather than pinkish orange. Its upper surface also tends to be darker, and to remain darker into old age--and its spores, on average, are a bit smaller. It is currently going under the name of the European species Craterellus cornucopioides. According to a recent paper by Matheny and collaborators (2010), LSU sequences are inconclusive on whether the West-Coast version is genetically distinct, and "careful morphological scrutiny," along with analysis of other, more species-informative genes, is required. I have collected all three versions (West Coast, eastern North American, and European) and while the West-Coast mushroom is closer in appearance and habit to the European species than the eastern North American species, it seems different to me and worthy of separate treatment--unless further molecular studies determine otherwise. 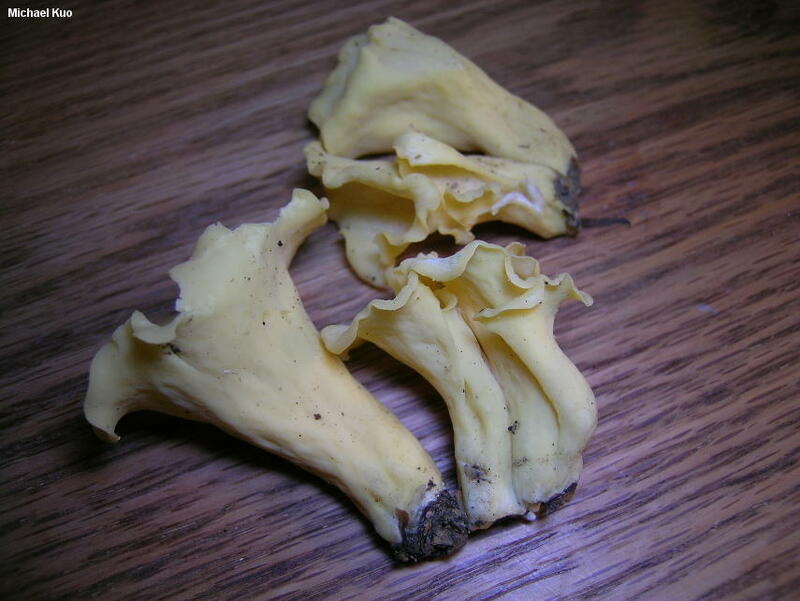 A pale yellow version of this species, sometimes called "Craterellus konradii," is sometimes collected (see the illustration); whether or not it is phylogenetically distinct is also uncertain. Ecology: Mycorrhizal with conifers (including Douglas-fir) and with hardwoods (including coast live oak, tanoak, and madrone); growing gregariously or, usually, in dense, tightly packed clusters; winter and spring; northern California and southern Oregon. The illustrated and described collection is from northern California. Fruiting Body: 3-6 cm wide; 4-10 cm high; without a clearly defined cap and stem; funnel-shaped at first, becoming deeply vase-shaped; the upper edge rolled under when young and often partly rolled under in maturity; thin-fleshed. Upper/Inner Surface: Black to dark blackish brown or very dark gray; finely roughened or finely scaly with dark, appressed fibers. Under/Outer Surface: Smooth or very shallowly wrinkled; pale gray, with a whitish bloom; when fresh contrasting starkly with the upper surface. 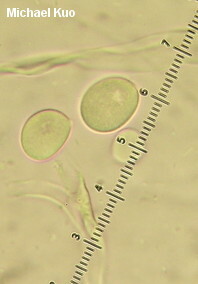 Microscopic Features: Spores 8.5-12 x 6-9 µ broadly ellipsoid; smooth; hyaline in KOH; contents homogeneous. 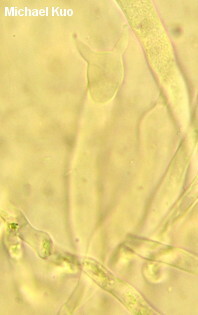 Basidia 65-75 µ long; 2-sterigmate. Elements of upper surface cylindric; septate; hyaline to brownish; 4-12 µ wide. Clamp connections absent. REFERENCES: (Thiers, 1985; Arora, 1986; Pilz et al., 2003; Matheny et al., 2010.) Herb. Kuo 02200304.